The Idaho Potato Commission (IPC) is a self governing agency of the State of Idaho that was established in 1937 as the Idaho Fruit and Vegetable Advertising Commission. It has many responsibilities, but its primary responsibility is to promote the Idaho potato through advertising, public relations, promotions and other marketing initiatives. 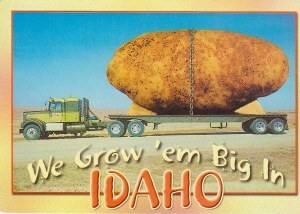 It also supports research to help expand the market for Idaho potatoes. Since its inception, the commission, which is one of the oldest commodity organizations in the US&A, has been a trailblazer on many fronts. One of its greatest achievements was the use of broadcastadvertising -- on radio and later television – when this type of marketing was in its infancy. In addition, the commission introduced the “Grown in Idaho” seal in 1959 to help elevate the visibility of Idaho potatoes and has become a symbol consumers actively look for when purchasing potato products. It's for these reasons that the Idaho potato is the best selling potato and is one of the most recognized and respected brand names in the United States.